One day, imagine, a U.S. president tells an Israeli prime minister: "Palestinian extremism damages American security. We need you to end it by achieving victory over the Palestinians. Do what it takes within legal, moral, and practical boundaries." The president continues: "Impose your will on them; induce a sense of defeat, so they give up their 70- year-old dream of eliminating Israel. Win your war." How might the prime minister respond? Would he seize the moment and punish the incitement and violence sponsored by the Palestinian Authority (PA)? Would he inform Hamas that every aggression would temporarily stop all shipments of water, food, medicine, and electricity? Or would he decline the offer? A cardiologist at Hadassah Hospital cares for a Palestinian baby. Many Israelis wrongly assume that if Palestinians gain sufficiently from the economic, medical, legal, and other benefits that the Jewish national revival brings them, they will relent and accept the Jewish presence. The answer? After intense consultations with Israel's security services and heated cabinet meetings, the prime minister would reply to the president with, "No thanks. We prefer things as they are." Really? That's not what one expects, given how the PA and Hamas seek to eliminate the Jewish state, the persistent violence against Israelis, and how Palestinian propaganda hurts Israel's international standing. But why? For four reasons: a widespread Israeli belief that prosperity undermines ideology; awe of Palestinian resolve; Jewish guilt, and timid security services. Each of these views can be readily refuted. Many Israelis assume that if Palestinians gain sufficiently from the economic, medical, legal, and other benefits that Zionism brings them, they will relent and accept the Jewish presence. Based on a Marxist assumption that money matters more than ideas, this outlook holds that fine schools, late-model cars, and handsome apartments are the antidote to Palestinian nationalist dreams. Like Atlantans, prosperous Palestinians will be too busy to hate. This idea began over a century ago, peaked around the time of the Oslo accords in 1993, and is closely associated with then-foreign minister Shimon Peres, author of the book, The New Middle East. Peres aimed to turn Israel, Jordan, and the Palestinians into a Middle East version of Benelux. More grandly, his vision hoped to emulate the French-German accord following World War II when economic ties served to end a historic enmity and form positive political bonds. In this spirit, Israeli leaders have long worked to build the West Bank and Gazan economies. They lobbied foreign governments to fund the PA. They helped Gaza by subsidizing water  and electricity, also facilitating water desalination plants. They proposed international support for an artificial island  off the Gaza coast with a port, airport, and resort. They even gave Gaza a gas field. But this effort failed, spectacularly so. Palestinian fury against Israel remains undiminished. Further, goodwill gestures have been met, not with gratitude, but with rejection. For example, upon the unilateral withdrawal of all Israelis from Gaza in 2005, their greenhouses were turned over to the Palestinians as a goodwill gesture, only to be immediately looted and destroyed. Perhaps most egregious are the instances of Palestinians treated in Israeli hospitals who show their gratitude by attempting to murder their benefactors. In 2005, a 21-year-old Gaza woman was successfully treated in Beersheba for burns from a gas-tank explosion; she then returned the favor by attempting to attack the hospital as a suicide bomber. In 2011, a Gazan mother whose infant lacked an immune system and who was saved at an Israeli hospital announced on camera that she wanted him to grow up to be a suicide bomber. In 2017, two sisters entering Israel from Gaza, so one of them could receive cancer treatment, attempted to smuggle explosives for Hamas. Why the failure? The French-German model included a factor absent from the Israeli-Palestinian theater: The defeat of the Nazis. Conciliation occurred not with Hitler still in power but after he and his goals had been pulverized; in contrast, the great majority of Palestinians still believe they can win (i.e., eliminate the Jewish state). They also view efforts at building their economy with suspicion, as Israel sneakily achieving hegemonic control. As early as 1923, the Zionist leader Vladimir Jabotinsky predicted this failure, calling it infantile "to think that the Arabs will voluntarily consent to the realization of Zionism in return for the cultural and economic benefits we can bestow on them." Steve Stotsky proved a decade ago the remarkably close correlation between funding for the Palestinian Authority and attacks on Israelis; each additional $1.25 million in aid translated into the killing of an additional Israeli. Despite perpetual disappointment, Israeli belief in Palestinian prosperity leading to conciliation lives on. Obviously, victory has no appeal to Israelis hoping, however forlornly, for the magic of late-model cars. Wars end, historical experience shows, not by enriching the enemy but by depriving it of resources, reducing its military capabilities, demoralizing its supporters, and spurring popular revolt. Toward this end, armies over the ages cut supply routes, starved cities, established blockades, and applied embargoes. In that spirit, were Israel to engage in economic warfare by withholding tax money, denying entry to laborers, and ending sales of water, food, medicine, and electricity, its actions would lead to victory. As to the argument that Palestinian economic despair leads to more violence: This is a canard. Only people who still hope to win continue with violence; those who have lost, give up, lick their wounds, and begin to rebuild around their failures. Think of the American South in 1865, Japan in 1945, or the United States in 1975. "In 1948, half the Palestinian population (700,000) fled. Every inch of Palestine was lost in 1967 when another 250,000 fled. Their "liberation" movement was subsequently driven with crushing force from Jordan and Lebanon. According to Palestinians, the Israelis killed their hero-leader, Arafat. Yet, none of this persuaded them that their defeat was final. In this light, I don't see how the comparatively modest measures Israel can take in peacetime would possibly persuade them they have lost." If the Palestinians have endured a century's worth of blows, this line of thinking holds, they can absorb whatever Israel now throws at them. Whatever the reason—the Islamic faith; the enduring influence of Amin al-Husseini; the unique network of global support—this extraordinary fortitude suggests Palestinian determination will not break. The reply to this? Israel was well on its way to victory between 1948 and 1993, but then the disastrous Oslo accords derailed it. Palestinian resolve was broken in 1993, in the aftermath of the Soviet collapse and Saddam Hussein's defeat, when Arafat shook hands with Israel's prime minister and recognized Israel. Then, rather than build on this victory, Israelis withdrew unilaterally from territory (Gaza-Jericho in 1994, Areas A & B of the West Bank in 1996, Lebanon in 2000, and Gaza in 2005), confusing Palestinians into thinking they had won. After these retreats, Jerusalem in 2007 abandoned any long-term plan and resorted simply to putting out fires. What, then, is Israel's current goal for Gaza? It has none. So, Israeli history divides into forty-five years of seeking victory and twenty-five years of confusion. Returning to the goal of victory will remedy those mistakes. As the most persecuted people in history—the victims of religious persecution, racism, pogroms, and the Holocaust—Jews have developed a keen sense of morality. The prospect of forcing Palestinians to endure the bitter crucible of defeat is one that most Israeli Jews and their diaspora supporters are loath to inflict. Overwhelmingly, Jews would rather use carrots than sticks, and reason not coercion. Likewise, when the economic situation in Gaza worsened in early 2018, one might imagine Jewish Israelis, the object of Hamas' murderous intentions, to be unconcerned or even pleased about their enemies' problems. But no: As one headline put it, "As Gaza approaches 'famine,' Israel, rather than world, appears most concerned." In part, this was for practical reasons—worrying about the price Israel would pay for a collapse in Gaza—but it also had a moral dimension: The prosperous Jews of Israel cannot sit by as their neighbors, however hostile, sink into the mire. 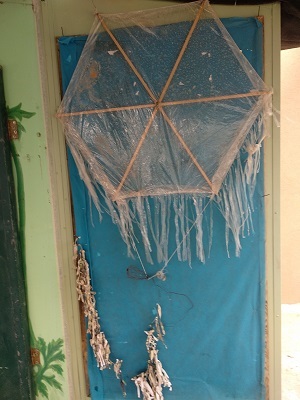 When Hamas devised incendiary kite weapons, the Israeli military did not stop the assault. IDF chief-of-staff Gadi Eizenkot explained: "I don't think that shooting at children and youth who sometimes fly balloons and kites is the right thing to do." But such a position impedes victory. "Eizenkot: I don't think that shooting at children and youth who sometimes fly balloons and kites is the right thing to do. Yet, voting patterns and polling data suggest that while this view remains as strong as ever in the diaspora, especially the United States, Israeli Jews have become tougher-minded. When painful concessions to the Palestinians brought not rewards but violence, many Israeli Jews despaired of the gentle approach and became ready to impose their will on the Palestinians through rough measures. The Eizenkot remark created a furor. A recent poll showed 58 percent of Jewish Israelis agreeing that "it will only be possible to reach a peace agreement with the Palestinians when they recognize they have lost their war against Israel." Two Israeli security establishments exist side-by-side: a fight-to-win one dealing with Iran and other distant enemies; and a defensive, police-style one dealing with Palestinians. The former seeks victory; the latter seeks calm. It is Entebbe vs. Jenin. It is stealing Iran's nuclear archive vs. letting kite arsonists ply their trade. The security establishment being defensive matters hugely because often it has the final say on Palestinian policy as shown by the Temple Mount incident in July 2017. After Palestinian jihadists killed two Israeli policemen with weapons hidden in the sacred esplanade, the Israeli government placed metal detectors at the entrance to the Temple Mount, a seemingly uncontroversial step. But Fatah demanded their removal, and despite Israel's populace and politicians overwhelmingly wanting the metal detectors to stay, the devices quickly disappeared because the security establishment—including the police, the border police, Shabak, Mossad, and the IDF—warned that leaving them in place upset the Palestinians and would prompt violence, chaos, and even a collapse. 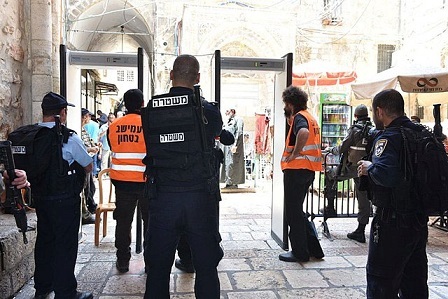 After Palestinian jihadists killed two Israeli policemen at the Temple Mount, the Israeli government placed metal detectors at the entrance. When Fatah demanded their removal, the security establishment warned that leaving them in place would prompt violence and chaos. "If the defense establishment thinks that … funds to Gaza are buying it calm, it will do anything possible to ensure that the funds keep flowing, even if that means that the calm is purchased at the cost of a war that will go on for decades." * Allows Hezbollah to acquire over100,000 rockets and missiles, then developed plans to evacuate a quarter-million Israelis in the event of war. * For decades encourages funding for the United Nations Relief and Works Agency for Palestine (UNRWA). This caution has several causes: First, Israeli governments built on multi-partner coalitions tend, in Jonathan Spyer's description, "to avoid focus on long term strategic issues, in preference for addressing immediate threats." Why address a problem when you can kick it down the road? Israelis, they reject the goal of victory; can lions attain permanent victory over hyenas? Security types often sound like Leftists, but they are emphatically not. Long and bitter experience, not misty idealism, defines their attitudes. That is why Commanders for Israel's Security, a group of nearly 300 retired IDF officers who reached the rank of general, representing 80 percent of those in that category, argues for a two-state solution, nearly twice that of the general Israeli Jewish population. Fourth, Israeli security professionals generally find current circumstances acceptable and do not want change. The PA under Mahmoud Abbas, for all its deficiencies (and contrary to the Arafat era) is a partner. Yes, it incites murder of Israelis and delegitimizes the State of Israel, but better these aggressions than to risk punishing Abbas, reducing his standing, and fomenting an intifada. This attitude leads to caution about change, skepticism toward a more ambitious approach, and reluctance about initiatives that might provoke Palestinian ire. Fifth, because Palestinians lack military power, they are seen as criminals more than as soldiers; accordingly, the IDF has turned from a military force into a police force, complete with a defensive mentality. Generals seek victory, but police chiefs aim to protect lives. Saving lives translates into seeing stability as a goal in itself. Generals do not enter battle with the goal of saving the lives of their soldiers, but that is how a police chief sees an encounter with criminals. Sixth, the Four Mothers Movement of 1997-2000 traumatized the IDF by managing to spark an emotional backlash against the occupation of southern Lebanon, leading to an ignominious withdrawal. This emphasis on saving soldiers' lives rather than on achieving strategic goals remains an abiding worry for the IDF leadership. In all, the main opposition to Israel's victory comes not from the hapless Left but from the security services. Fortunately, the defense establishment has dissenters who both seek political leadership and Israel's victory: Gershon Hacohen, who calls for political leaders to exercise independent judgment, is a good example; Yossi Kuperwasser is another. All who hope for a resolution of the Palestinian problem should urge the Israeli government to squeeze the PA and Hamas. This also suits Palestinian interests, liberating them from their obsession with Israel, so they can build their own polity, economy, society, and culture. Everyone gains from an Israel victory and a Palestinian defeat. Daniel Pipes (DanielPipes.org, @DanielPipes) is president of the Middle East Forum and publisher of the Middle East Quarterly. New York: Henry Holt & Co, 1993. Haaretz (Tel Aviv), Oct. 11, 2012. The Times of Israel (Jerusalem), Apr. 9, 2017. The Washington Post, June 20, 2016. IMRA (Independent Media Review and Analysis, Kfar Sava), Sept. 23, 2012. Associated Press, Sept. 13, 2005. BBC News (London), June 21, 2005. Fox News, Jan. 13, 2011. Vladimir Jabotinsky, "The Iran Wall (We and the Arabs)," The Jewish Herald (Johannesburg), Nov. 26, 1937. 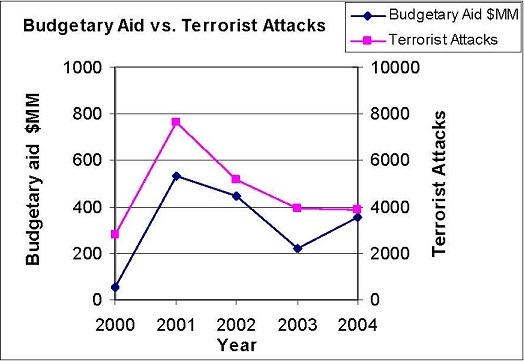 Steve Stotsky, "Correlating Palestinian Aid and Homicides 2000-2007," CAMERA, Boston, Sept. 7, 2007. Daniel Pipes, "Lifting the 'siege' [on the Palestinian Authority]?" The Jerusalem Post, Mar. 14, 2001. Israel Hayom (Tel Aviv), July 15, 2014. Avi Issacharoff, "As Gaza approaches 'famine,' Israel, rather than world, appears most concerned," The Times of Israel, Jan. 26, 2018. Gadi Eizenkot, interview, Israel Today (Jerusalem), July 19, 2018. Daniel Pipes, "Israel Victory Gains Strength," Israel Hayom, July 3, 2018. Daniel Pipes, "Why Israel Removed the Metal Detectors," The Wall Street Journal, July 25, 2017. Einat Wilf, interview, Israel Hayom, May 25, 2018. Associated Press, Apr. 20, 2017. Steven J. Rosen and Daniel Pipes, "Lessening UNRWA's Damage," The Jerusalem Post, July 10, 2012. Jonathan Spyer, "Israel Is Going to War in Syria to Fight Iran," Foreign Policy, Sept. 28, 2017. Efraim Karsh, Arafat's War: The Man and His Battle for Israeli Conquest (New York: Grove Press, 2003); Yossi Beilin, interview, Haaretz Weekly Magazine, Mar. 7, 1997; see, also, Beilin interview with Ofer Aderet, Haaretz, Oct. 23, 2016. "About Us," Commanders for Israel's Security, Israel. The Jerusalem Post, Jan. 25, 2018. "'Four Mothers' Leave Lebanon in Peace," Four Mothers Movement, accessed Aug. 26, 2018. Gershon Hacohen, "Why National Leaders Can Go against Expert Advice," Begin-Sadat Center for Strategic Studies (BESA), Ramat Gan, Aug. 24, 2017.